The year was 1917. 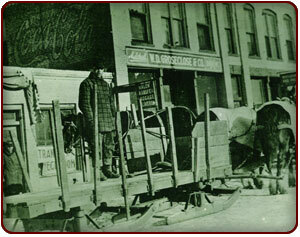 At 18 years of age, Bill Whalen Sr. purchased a team of horses and dray (sled). Based out of a small office in downtown Grand Forks, ND, Bill began hauling various items for customers within the Grand Forks area. The loads varied widely, from trunks, furniture items, and even coal. In the summer months, Bill replaced the sled's wooden runners with wooden wheels. A true "All Weather" vehicle. Years later, as motorized transportation became more common place, Bill purchased a truck and expanded his hauling territory. Bill and Dolly Whalen raised seven children in Grand Forks. With the children and others to help with the "moving" business, the Whalen family purchased a warehouse. They began to store furniture and freight items, became affiliated with North American Van Lines in 1951, and incorporated in 1963. The van line affiliation allowed "Whalen Transfer" to not only move household goods locally, yet also handle relocations across the country and into Canada. Bill and Dolly's seven children had large families of their own, with many of those grandchildren working at the business throughout the years. Currently, the third generation of Grand Forks Whalens owns and operates "Whalen's Moving & Storage Inc." The company is now a full service moving company, offering local, cross country, and international relocations. Whalen's Moving & Storage offers expert packing and crating services, and has a large amount of storage facilities where items are hand-wrapped and safely stored. True to the humble beginnings by Bill Whalen Sr. and his horse and sled, Bill's grandchildren take pride and care in ensuring Whalen's Moving & Storage handles customer's goods as if they were their own. Whether it's relocating a semi truck full of household goods across the country, or just one item across town, Whalen's Moving & Storage always strives to ease any stress or anxiety a customer may feel when pondering "How am I going to get my things safely moved?"